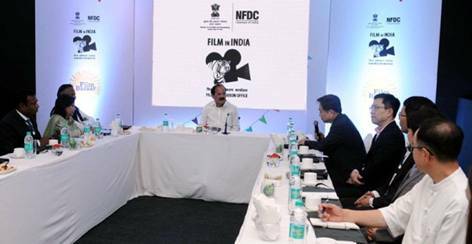 Panaji : The Minister for Information & Broadcasting, M Venkaiah Naidu, today met the Korean delegation led by the ambassador of the Republic of South Korea on the side-lines of the 47th International film festival of India, in Goa. Speaking on the occasion the Minster highlighted the importance of the MoU signed between the two nations in 2014 on co-production and exchange of ideas. Government was working together with Republic of Korea for strengthening the cultural relations and was also exploring the possibility of sharing ideas of mutual interest. Naidu expressed his happiness for Korea, being the main partner in the cultural sphere. Minister also said the government was keen to work and cooperate in the domain of Film production in a way that could benefit both countries.